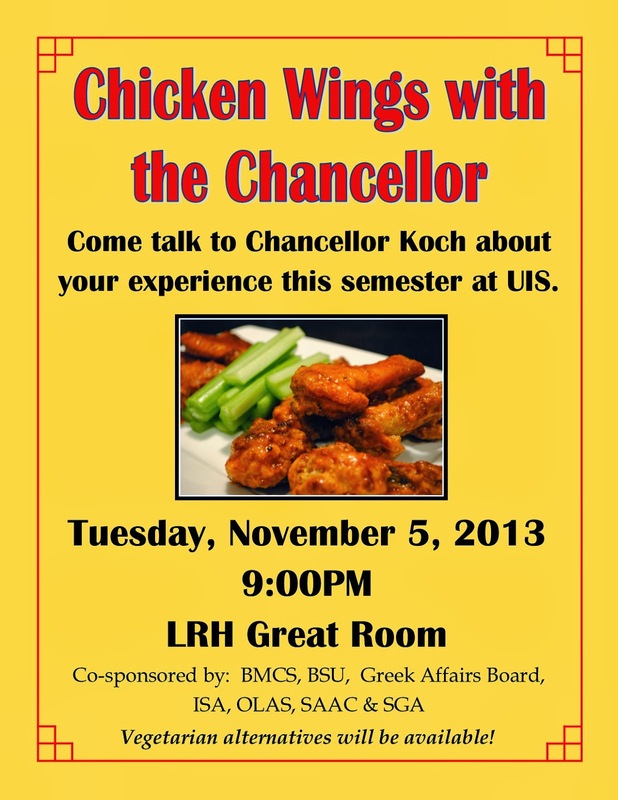 UIS Events: Students invited to have "Chicken Wings with the Chancellor"
Students invited to have "Chicken Wings with the Chancellor"
WHAT: Students are invited to talk to Chancellor Susan J. Koch about their experiences at UIS during “Chicken Wings with the Chancellor”. WHEN: Tues., Nov. 5, 2013 at 9 p.m. 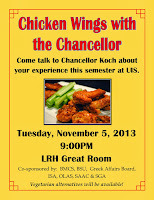 DETAILS: The forum will allow students to share their ideas and opinions with Chancellor Koch over FREE chicken wings in an informal setting. This is the fifth forum in a series designed to create an ongoing open exchange of ideas between students and Chancellor Koch. The idea is to make the campus’ top leader more available to students in a comfortable environment. This event is co-sponsored by the Black Male Collegiate Society, Black Student Union, Greek Affairs Board, International Student Association, Organization of Latin American Student, Student Athlete Advisory Committee, and the Student Government Association. UIS Theatre presents "Clybourne Park"